Wind Image™ for ArcMap ® provides you with a very robust set of image integration tools that allow you to process images inside of ESRI ArcMap ® Software. With Wind Image™ you can process images that have GPS data embedded in the images EXIF header in addition you can edit any image and enter the coordinates where the image was taken. When processing images Wind Image™ provides you with more output options for ESRI software than any other product on the market. You can create simple SHP files or Feature Classes with the images hyperlinked or robust image datasets where the images are embedded in the feature class and all images are stored within the Geodatabase. Wind Image™ currently supports all ESRI Geodatabase formats including Personal Geodatabase®, File Geodatabase®, and ArcSDE®. Along with processing the images into a geo-referenced dataset Wind Image™ also provides a number on image processing tools that allow users to modify and enhance images. 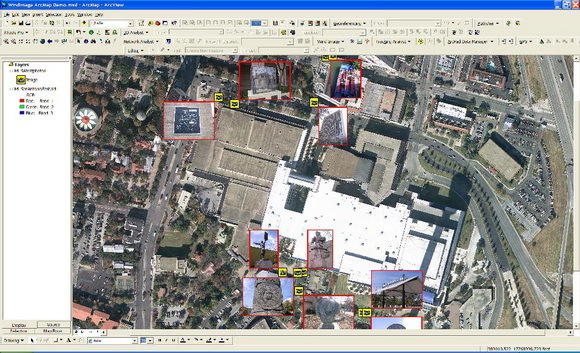 Users also have the option to label there images with the coordinates the photo was taken as well as the date and time it was taken. 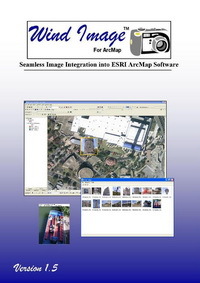 Wind Image™ For ArcMap® truly provides a seamless solution to integrate the Ricoh 500SE® GPS ready camera and ESRI ArcGIS® software. Create shp files and ESRI Geo-database feature clases. 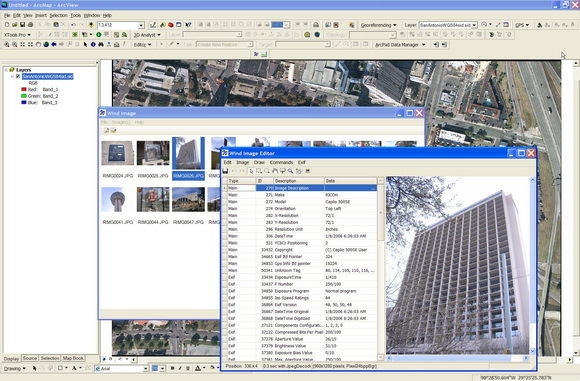 Supports all ESRI Geo-database types Personal, File, and ArcSde. Process photos into hyperlinked and raster embedded datasets. Robust set of photo editing tools. Imprint date time, GPS position, and attributes on photos. Native support in both ArcMap and ArcReader for viewing raster embedded datasets. Single license can be installed on two computers as long as they are only used by one user. Such as a laptop and desktop PC. One year of upgrades included. Automatic rotation of symbology on compass direction. Add processed images to map display for easy printing.